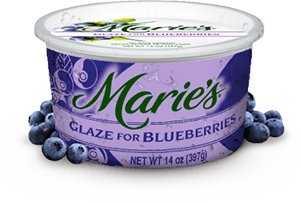 Perfection in little, round, blue packages, blueberries are even more irresistible when paired with the luscious accompaniment of Marie’s Blueberry Glaze. Picture a tray of perfect little tartlets or a flaky pie bursting at the seams with berry goodness and Marie’s Glaze for Blueberries. Sweet, right?